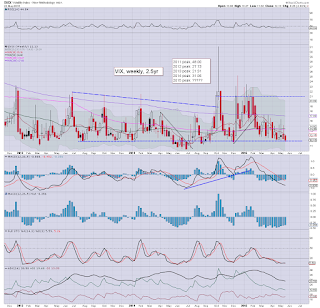 With US equities closing the week moderately mixed, the VIX remained subdued, settling +0.2% @ 12.13 (intra low 11.82). 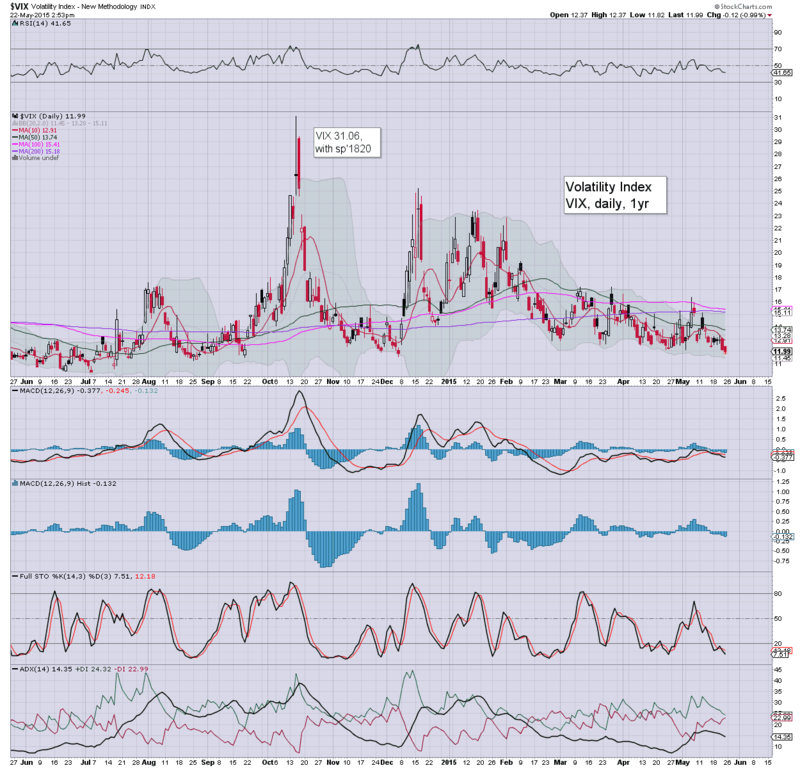 Near term outlook is for continued equity strength into June, which should equate to VIX remaining within the 15/11 zone. Suffice to say, with the Dow/Sp'500 breaking new historic highs this week, it was no surprise to see the VIX continue to cool. Today's low of 11.82 was the lowest level since Dec 5th' 2014. 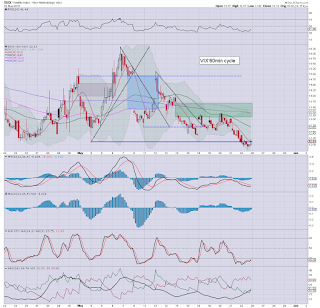 Now its a case of whether sp'2170s (whether June... or July) might equate to VIX 10s... or even 9s - challenging the all time VIX low of 9.31 - Dec 22nd 1993. US equities closed moderately weak, sp -4pts @ 2126 (intra high 2132). 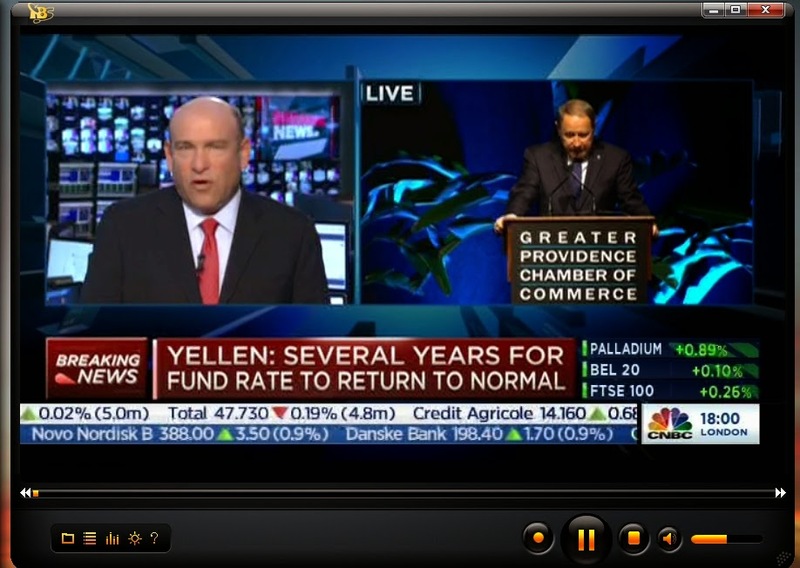 The two leaders - Trans/R2K, settled lower by -0.8% and -0.4% respectively. 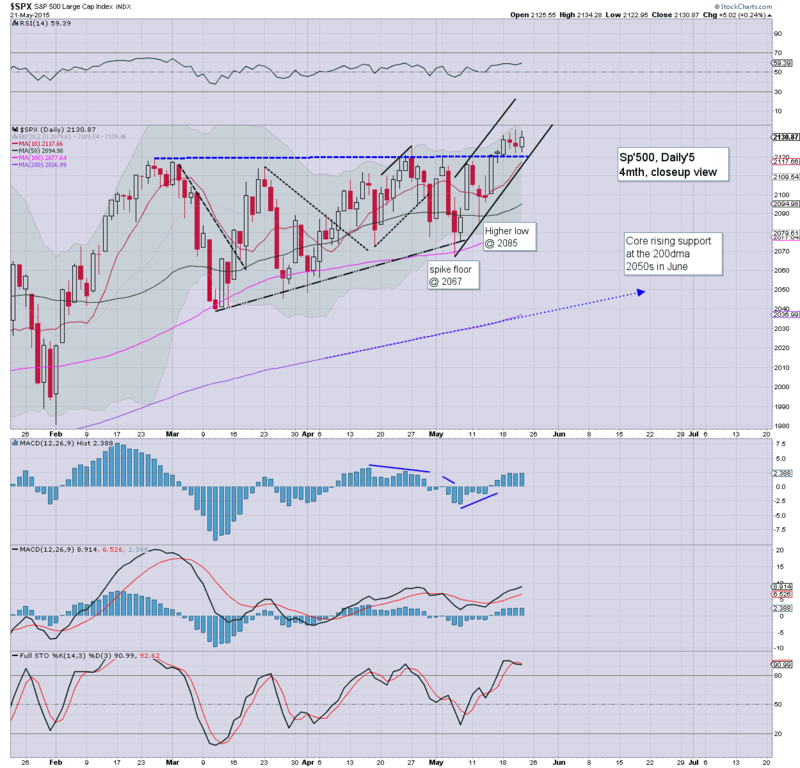 Near term outlook remains broadly bullish into the next FOMC of June 17th. *a somewhat weak closing hour, but as ever... nothing of significance, merely a case of some cashing out ahead of the long 3 day weekend. .. and another week comes to a close at the world's most rigged and twisted casino. 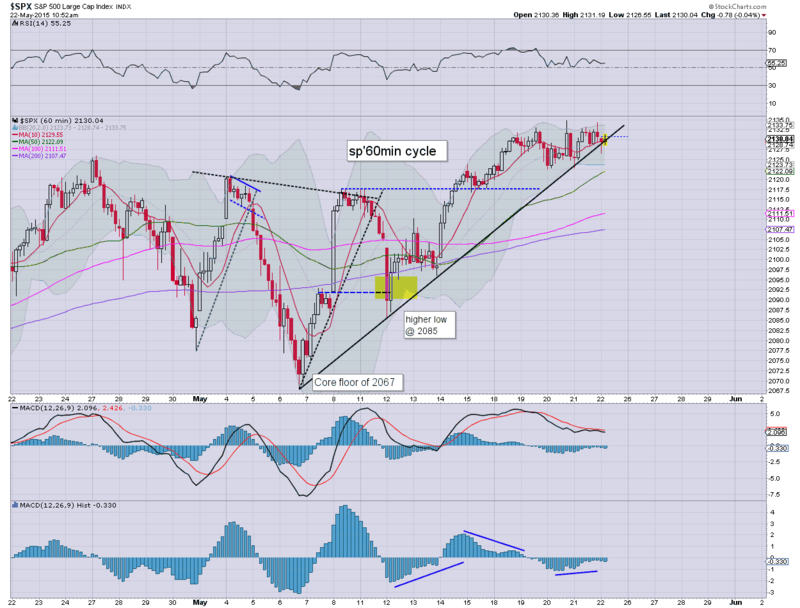 Without question, with another pair of new index highs - Dow/Sp'500, it was another week for the equity bulls. This is despite some distinct weakness in the 'old leader' - Trans. Understandably, it has received some considerable mainstream attention, but one index does not override the broader market. 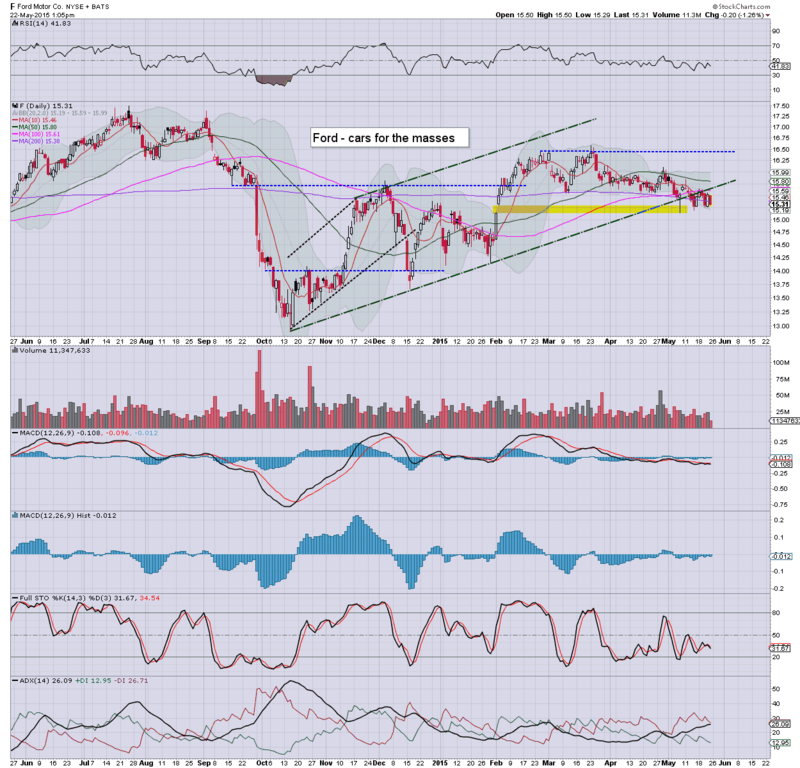 Until the market is trading under the giant sp'2K threshold, I can't take ANY bearish talk seriously. 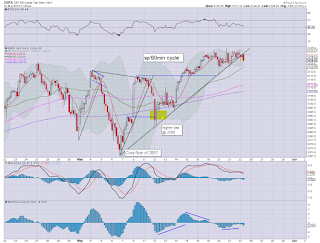 It is merely the same top calling nonsense that we've seen the key breakout in summer 2013. 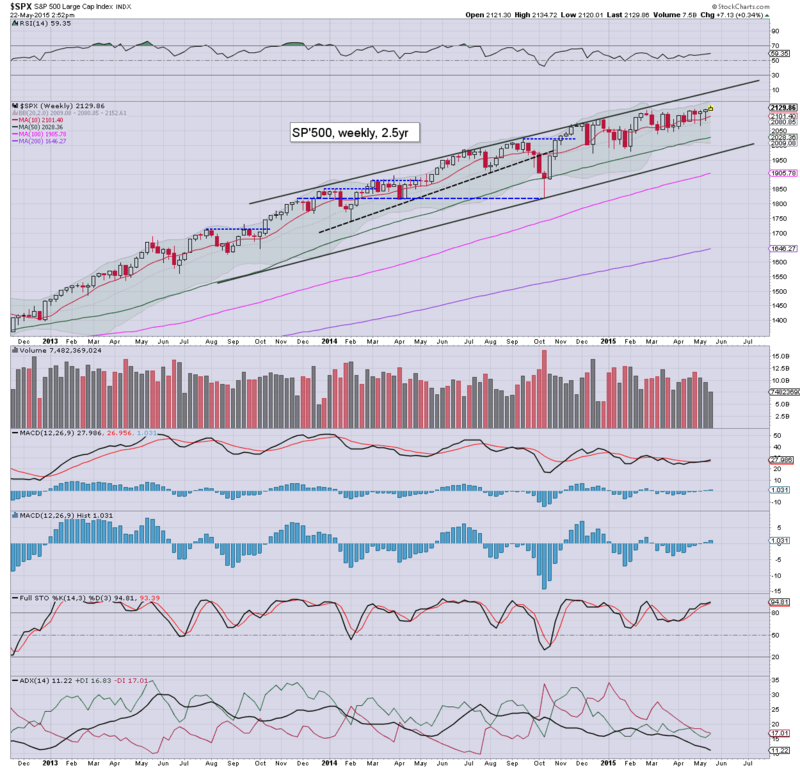 Most US equity indexes are set for a third consecutive net weekly gain.. if somewhat moderate, with the sp +0.3%, having broken a new historic high of 2134. 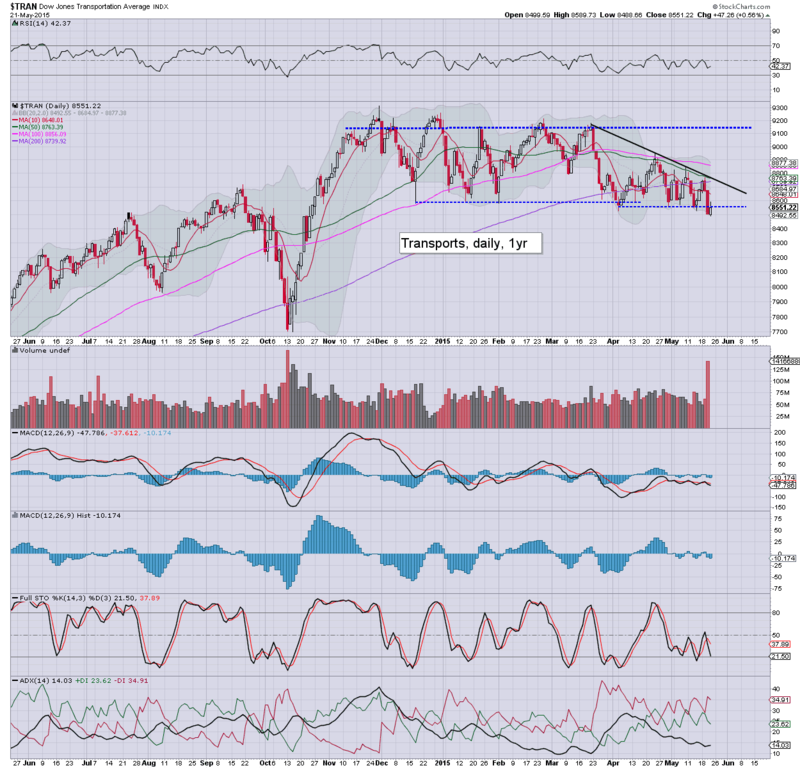 The notable exception is the Transports, -2.2% in the 8400s. Relative to the strong USD, equities are performing better than most realise. 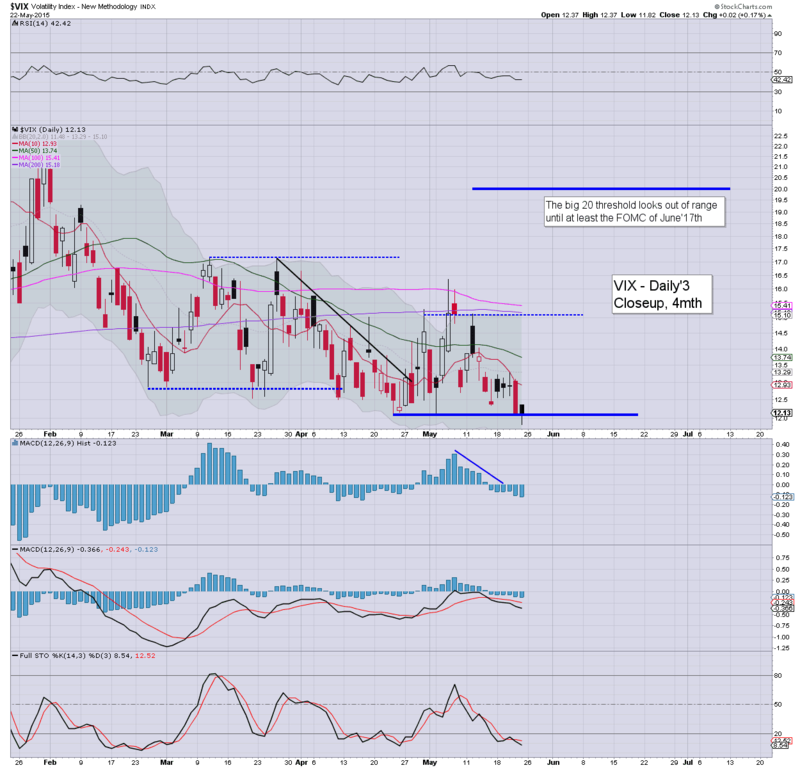 *the VIX is at levels last seen Dec 5th' 2014. Right now, the most realistic 'best case' for the VIX bulls would be the 15s, but even that looks difficult in the reminder of May. Despite all the rumbling bearish chatter... it has been another week for the equity bulls.. not least with new historic highs in the Dow/sp'500. Sure, the two leaders - Trans/R2K are showing distinct weakness... but as a collective, the market is comfortably holding within the broader upward trends. The Yellen has managed to avoid saying anything that might have upset Mr Market, with equities remaining in minor chop mode. 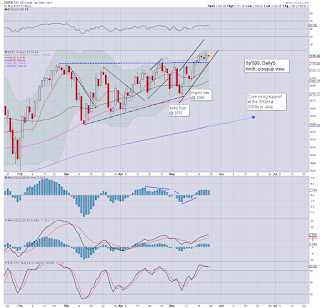 As things are, the sp'500 is set for a third consecutive net weekly gain of around 0.4%. 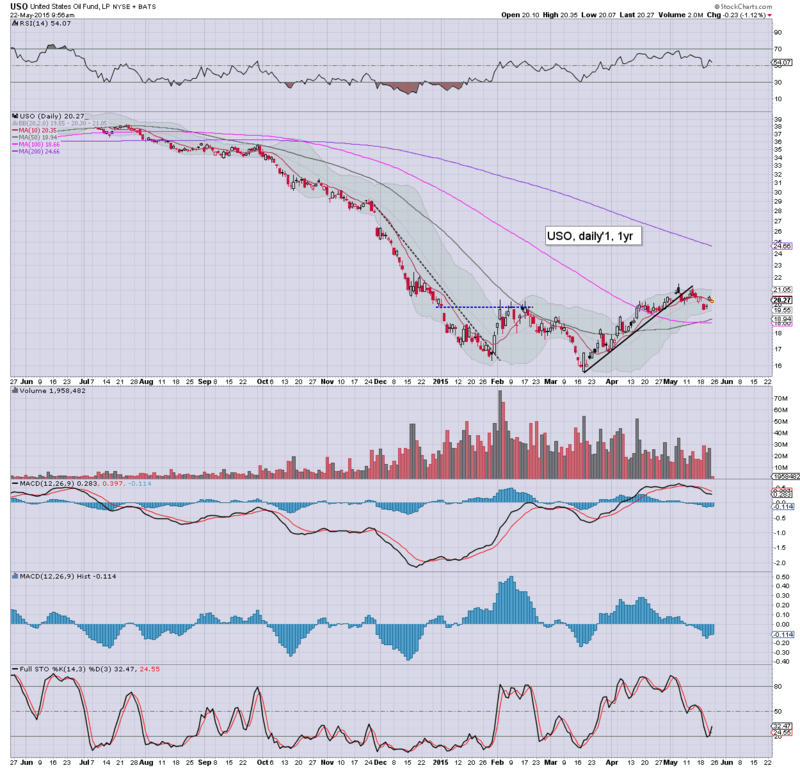 With a strong USD, the metals and oil remain notably weak, Gold -$3, with Oil -1.7%. Well... market looks set for minor chop into the weekend. Little else to add. A notable black-fail candle on the daily cycle. 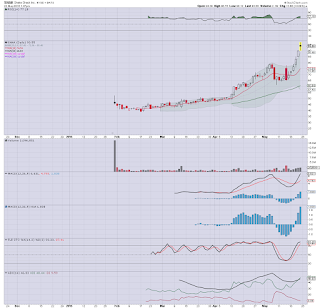 Having soared from the IPO price of $21... SHAK looks like it has maxed out this morning @ $96.75. *not that I'd advocate shorting ANY of the momo stocks.. nor any of the IPOs. Overly risky.. whilst the broader market remains strong. Still... SHAK will merit a little attention next week. The broader market remains in minor chop mode ahead of the Yellen. There is notable weakness in the Trans, -0.8% @ 8485. 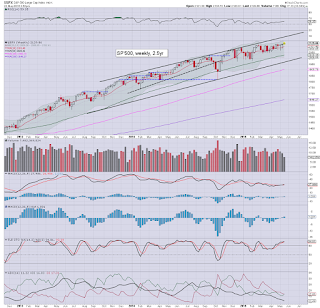 Net weekly gains still look probable for most indexes. 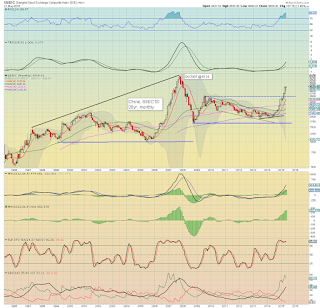 USD is holding strong gains of 0.8% in the DXY 96.00s. Metals are flat, whilst Oil is sliding, -1.8%. *VIX -0.7% in the low 12s... a touch above the earlier low of 11.91, but still... highly indicative of a market that is utterly not concerned about any 'spooky news' across the long weekend. Well.. lets see what the algo-bots make of the Yellen.. I'd guess a prepared speech might appear as a press release at 1pm... rather than the market having to actually listen to her for an hour. 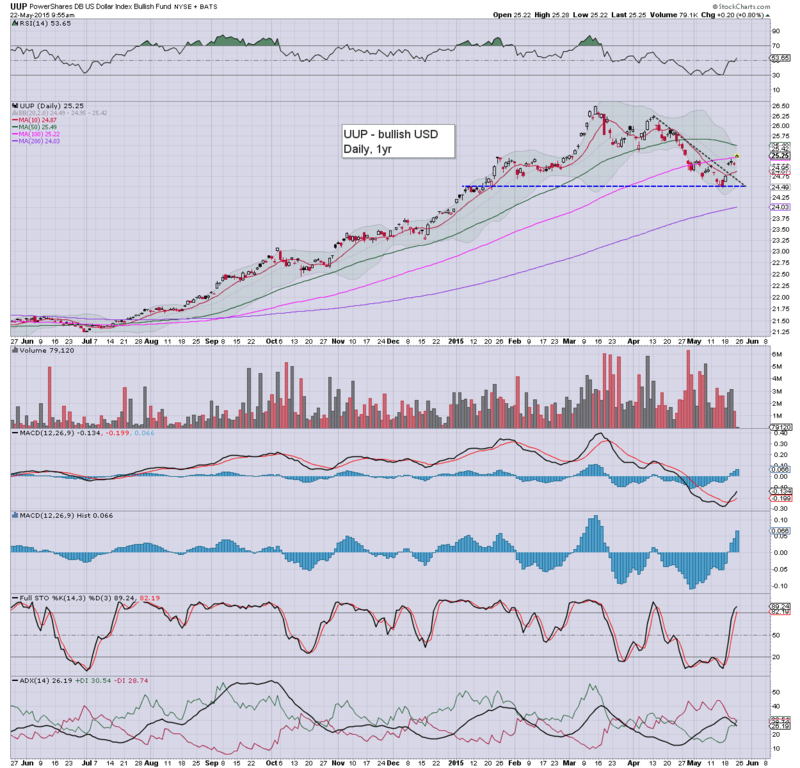 notable strength: AAPL +0.8% in the $132s. 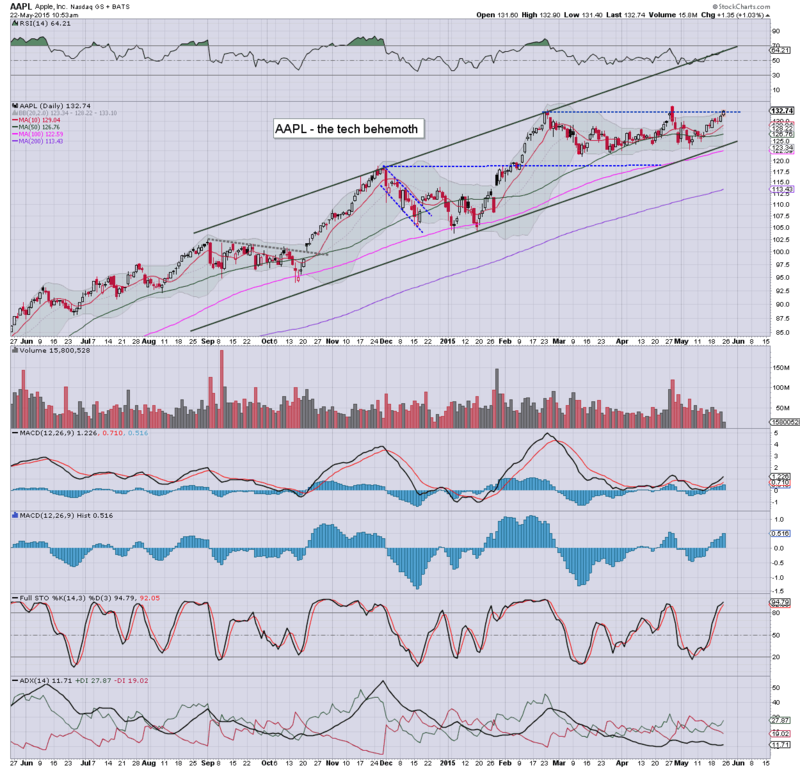 With stocks like AAPL still clawing higher, there is little realistic hope for the bears into the weekly close. Market reaction is largely muted... it bodes well for the equity bulls into the close. 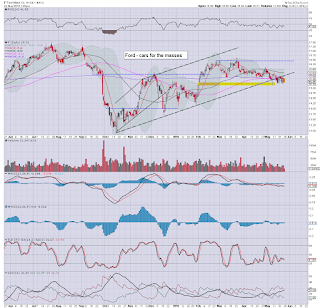 notable weakness, Ford (F), -1.3%... daily chart is not so pretty, a failure to hold the recent spike low would be a real problem. 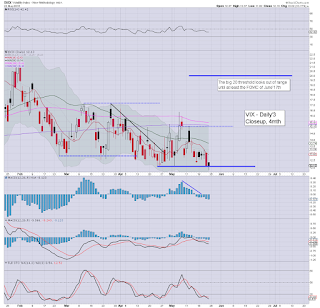 1.11pm.. VIX notably breaks a new low for the year... 11.82... completely confirming the utter lack of market worry. 1.22pm.. Market chop.. as the Yellen continues.... with more use of Transitory.. and excuses about snow in winter. Overall though... this is ideal fedspeak for Mr Market... ahead of the weekend. USD is strong, now +1.0% in the DXY 96.20s.. as the Euro is distinctly weak.. set to lose €/$ 1.10s. 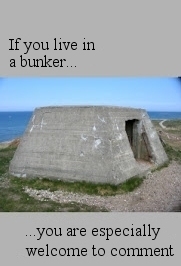 1.38pm.. 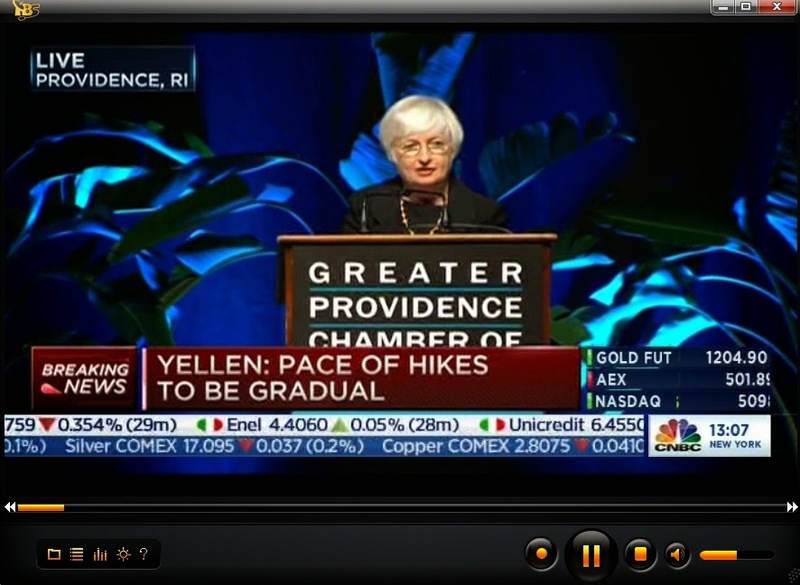 Thus concludeth the Yellen..... Mr Market seems more than content. With the CEO of PRINT central set to appear at 1pm to deliver her latest outlook on the US/World economy, the market has seen a minor wave lower. 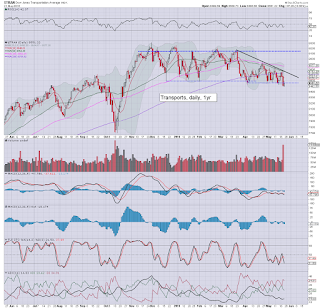 However, as usual, there is particular weakness in the Transports, -1.1% in the 8400s. Metals remain flat, whilst Oil is lower by a rather significant -1.5%. .. little to add.... ahead of the Yellen. Yes, the Trans will be important to keep in mind, but it is NOT the entire market, never mind the issue that other world markets are continuing to battle upward. US equity indexes remain seeing minor chop... ahead of the Yellen (1pm). Relative to the strong USD, +0.8% in the DXY 96.00s, equities are holding up very well, a net weekly gain still appears likely for most indexes. Metals are back to flat, whilst Oil is -1.0% (intra low -2.0%). 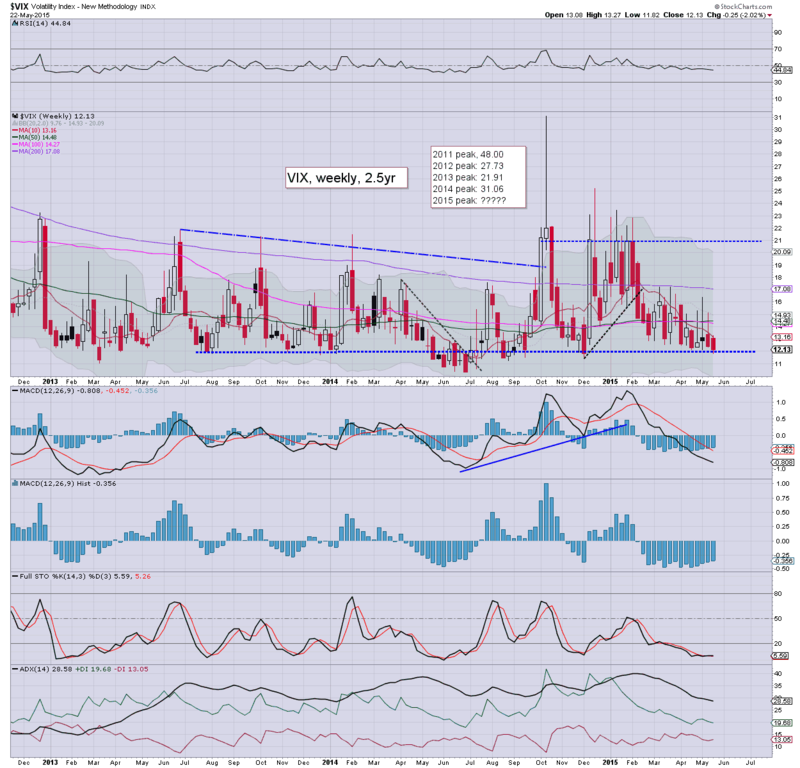 *VIX -1%.. hitting a new multi-month low of 11.91..., the lowest level since Dec'5th 2014 (11.53). Market appears very content to be in minor churn mode ahead of the Yellen. Trading vol' is increasingly light of course ahead of the holiday.. and that will certainly favour the equity bulls. ...with the Nasdaq comp' just 0.6% away from breaking the March' 2000 high of 5132. It remains somewhat bizarre how many are still dubious of much higher levels in the US market.. not least as other world indexes continue to climb. The USD has swung from a pre-market decline of -0.2% to +0.9% in the DXY 96.10s. This is putting some notable pressure on most asset classes, Oil -1.2%, whilst Gold -$2 (earlier +7). The market now awaits the Yellen at 1pm. A pretty dynamic early swing in the USD.. with the DXY 96s... as I was noting yesterday. 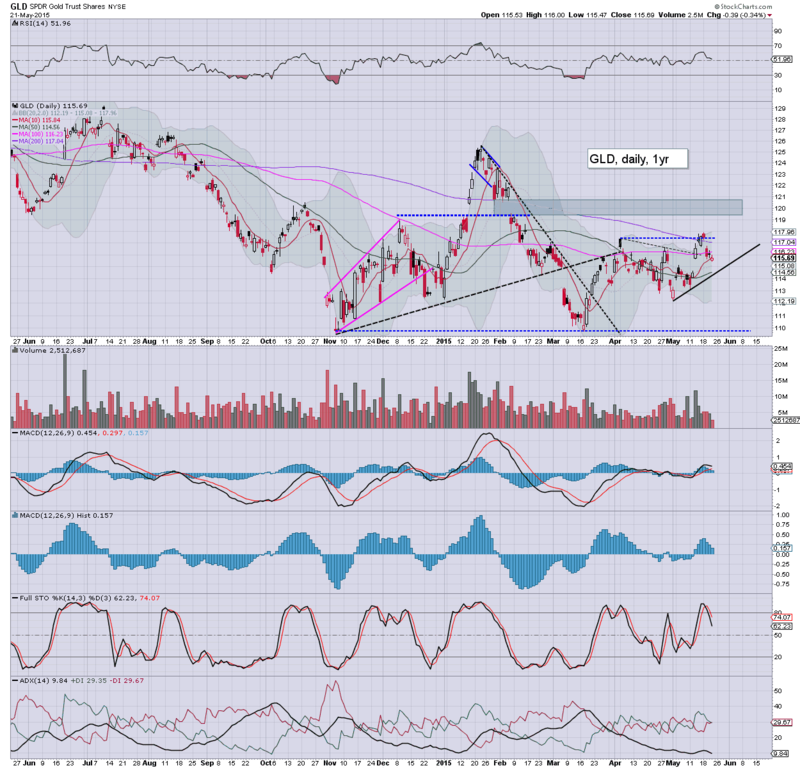 The UUP chart is offering the 25.50s... where there is multiple resistance... that'd equate to DXY 97s. *to be clear, I do NOT believe a key floor in the USD has been achieved. There still seems a fairly high chance of another wave lower to the DXY 90/89s. 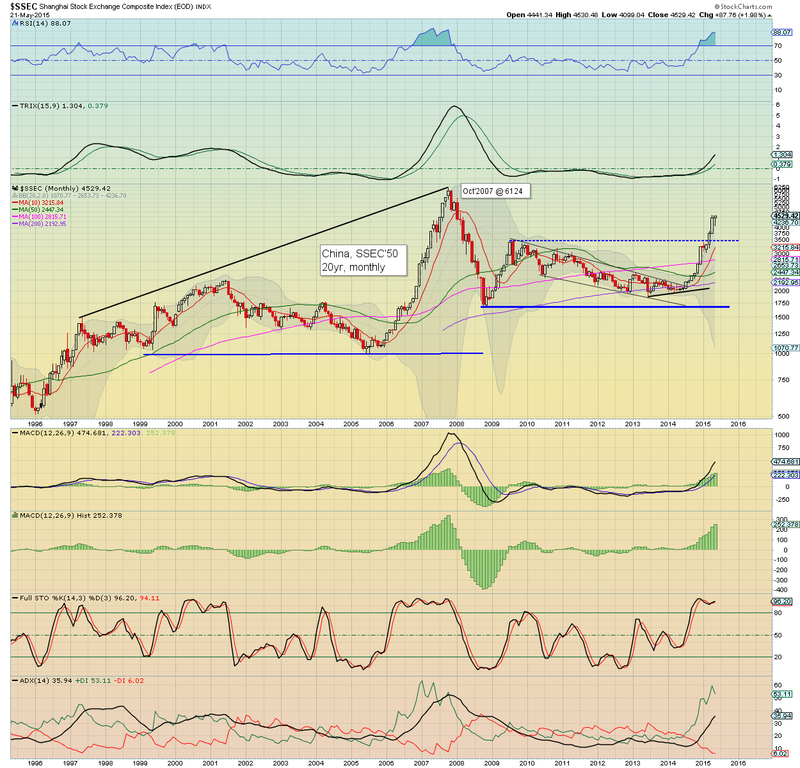 That view would get ditched on any daily close in the DXY 101s. 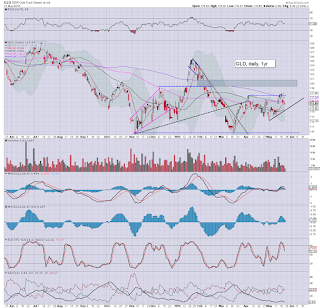 notable weakness, SDRL -3%.. although that is a minor retrace of recent gains. As for the Yellen later, could she say something stupid to give the market an excuse to snap lower into the weekly close? Sure, but it is a pretty lousy setup for the bears... with a long weekend ahead. Good morning. 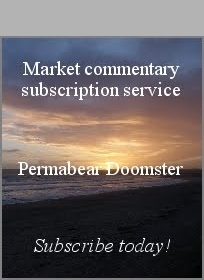 Futures are fractionally lower (ahead of the CPI data), sp -1pt, we're set to open at 2129. Metals are bouncing, Gold +$5. USD is continuing to cool, -0.2% in the DXY 95.00s. Oil is moderately weak, -0.8%. *notable overnight action... China, +2.8% at a new cycle high 4657. The giant 5K threshold is now viable within the next few weeks. A net weekly gain for the sp'500 - and most other indexes, looks due. It would make for the third consecutive positive week, and it remains probable that we'll be trading in the 2170s by the next FOMC of June 17th. 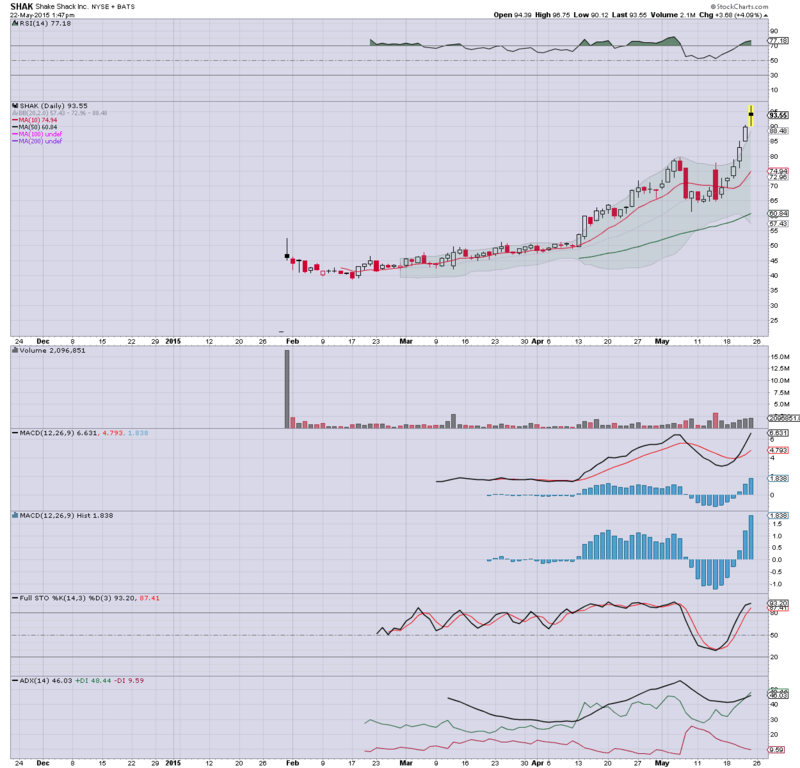 BBRY +3.8%... a 12 million share buy back. Solves ALL the problems, right? (I've no idea why anyone would not look at the core, rather than take out food/energy). Like the UK, USA has deflation... but then... I like lower prices. Market reaction.... sp -4pts..... metals turning a touch negative. 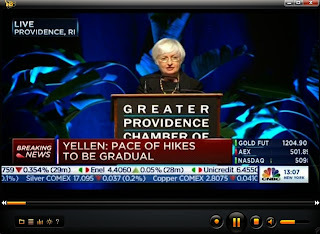 ... now its a case of what the Yellen has to say this afternoon. 8.42am sp-6pts.... Gold back to flat... we're clearly seeing a moderate turn after the CPI data. re: BBRY... it'd seem the gains is because of an announced 12 million share buy back. No doubt, Denniger will be jumping up and down with that news. *hey, deflationland, if you're out there... HELLO, and I hope you're not short BBRY. Many of these share buy backs are set to last into 2017 (GE is a prime example)... and it remains a primary reason why equity bears should broadly just stay away for another two years. 8.55am. USD has seen a major swing, now +0.5% in the DXY 95.70s. 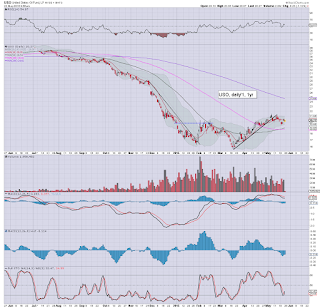 If we can see the 96s... metals and Oil will be weak into the weekly close. Whilst many continue to question the current levels of the US equity indexes, across the Atlantic ocean, the most problematic of the EU PIIGS - Spain, is seeing its equity market making another attempt to break/hold the key 12K threshold. 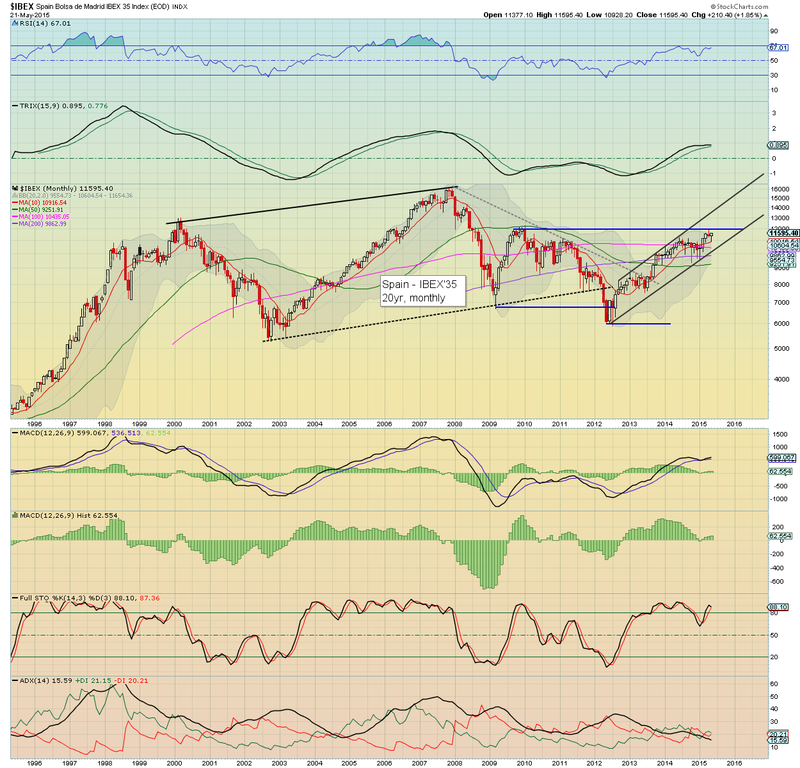 A monthly close >12k would strongly imply for much higher levels, not just for Spain.. but all world indexes. 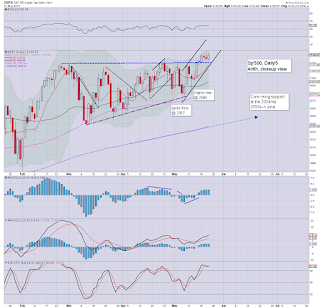 The Spanish IBEX is currently net higher for May by 1.8%, with a rather bullish spike floor candle. First key target is 12K... the peak from late 2009. 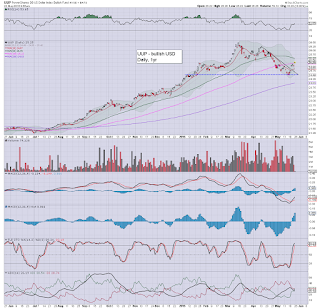 Any monthly close in the 12000s should clarify that 15/16K is due by next late spring. A grander target would be 20K by mid 2017... but first things first.... lets see how May concludes... and if June can break/hold above 12000. 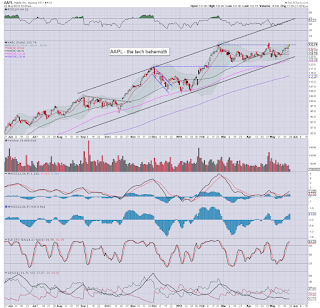 Last summer, I made it quite clear, any break >2500 would bode for 3500, and eventually the big psy' level of 5K. The rate of increase in the SSEC was even faster than I had expected, and 5K is viable as early as next month. 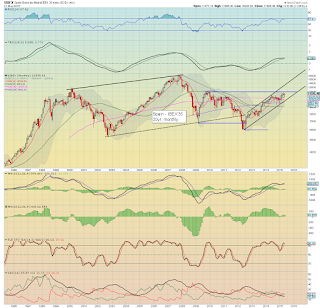 The point should be clear, the IBEX is in the same situation as the SSEC was just a few months ago. When you consider the QE of the ECB and low rates, the IBEX looks set to break 12K... and that is about as bullish a signal as it gets. Friday will see CPI data, and that should certainly cause some dynamic price action in at least some parts of the US capital markets. *it is highly notable that the Yellen will be speaking at 1pm on the economic outlook, and Mr Market will be closely listening. I would imagine a press release of prepared remarks to hit the market at 1pm, and a probable Q/A session stretching into the 2pm hour. Since next Monday the market is CLOSED, there will clearly be some pre-holiday issues.. so expect increasing price chop into the weekly close. 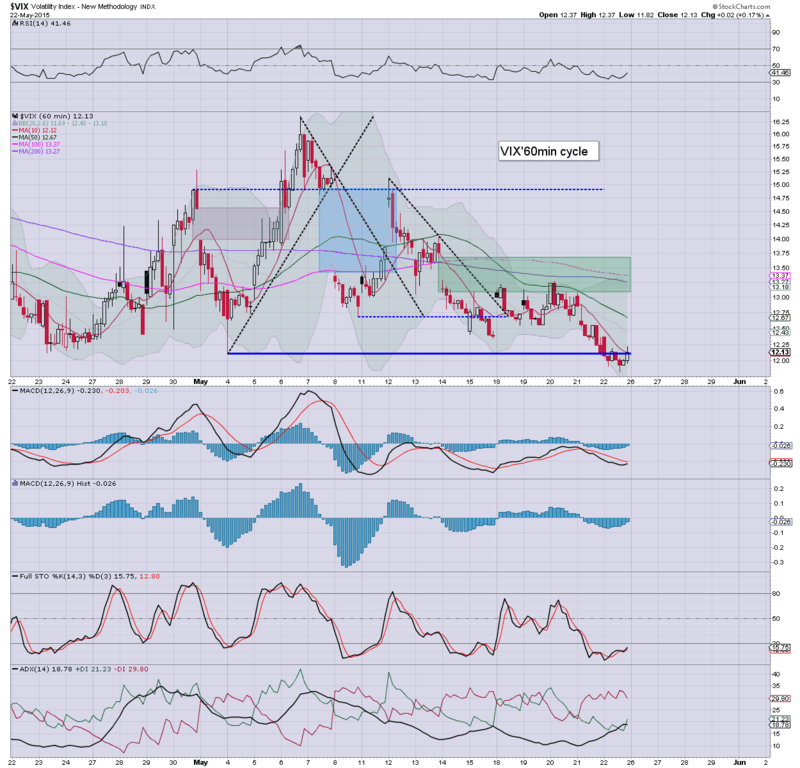 Yours truly remains more focused on the precious metals than the equity indexes, and I remain short Gold - via GLD. Today saw some moderate weakness, but if the USD can resume higher tomorrow into the DXY 96s, Gold will be highly vulnerable to a major net daily decline. US equity indexes closed moderately mixed, sp +5pts @ 2130 (intra high 2134). 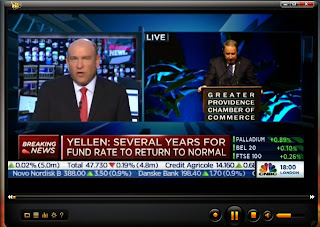 The two leaders - Trans/R2K, settled +0.6% and -0.1% respectively. 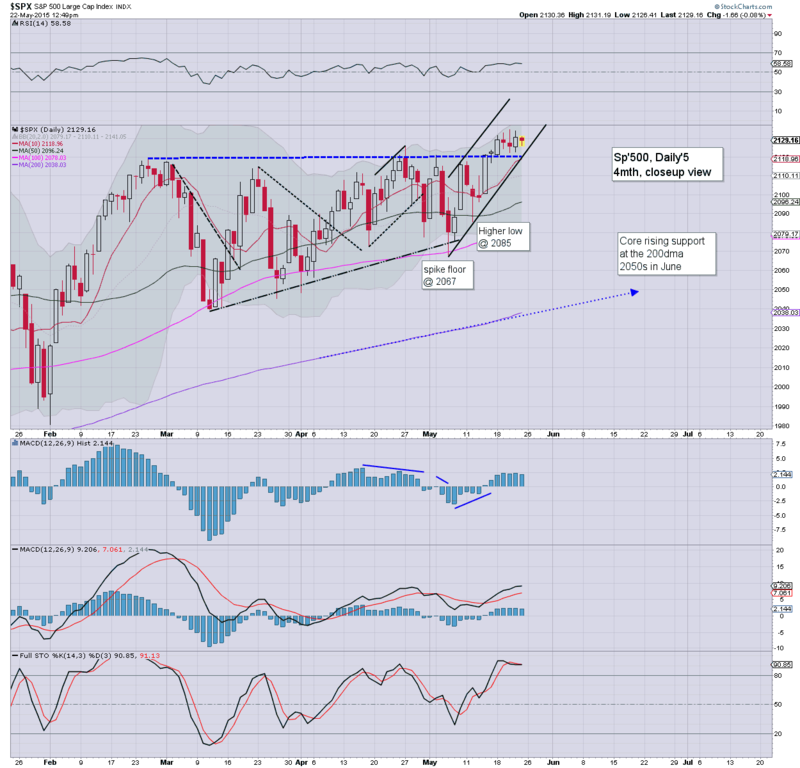 Near term outlook remains bullish into the holiday weekend, and more broadly.. into the next FOMC of June 17th. *Despite seeing the biggest gains today, the Trans remains notably weak.. with first resistance around 8750. 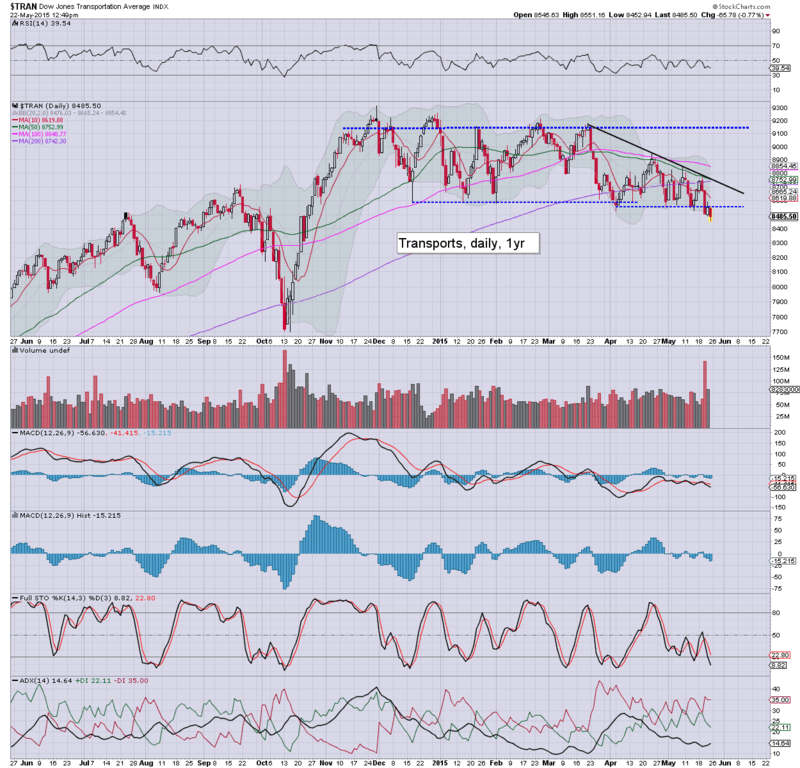 Best guess though... Trans to eventually break higher.. having churned largely sideways since last November. 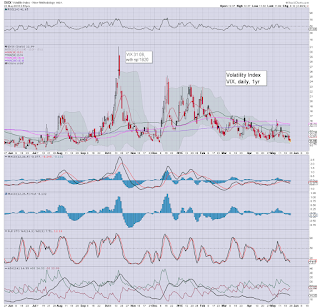 The broader market remains very strong, as reflected in a VIX that can not even break/hold the low teens. For the moment, there is simply little reason to consider shorting the main indexes, not least that it seems pretty clear the Fed won't be raising rates until the FOMC of Sept'17th. Most should be starting to consider that the market could simply grind higher across the summer... into early Sept'. *to be clear though, higher rates are exceptionally bullish for the financials.. and that would also bode well for the broader market into 2016.